STEAMPUNKERS USA, Beautiful Vibrant Stones & Excellent Service Each stone has its own special characteristics. Natural inclusions and impurities make a stone more memorable and precious over time. Natural stones are unique in that they become more glossy and vibrant with use. No two are alike so they offer a very wide selection of colors, shapes, and variations making it infinitely enjoyable to collect. We also take pride in our quality control process. Every hand selected gemstone is inspected prior to packaging using a quality control checklist. Each stone is packed to prevent damage and are assigned tracking numbers. We take sanitation seriously. All items are shipped in plastic bags with quality cords and/or earwires. 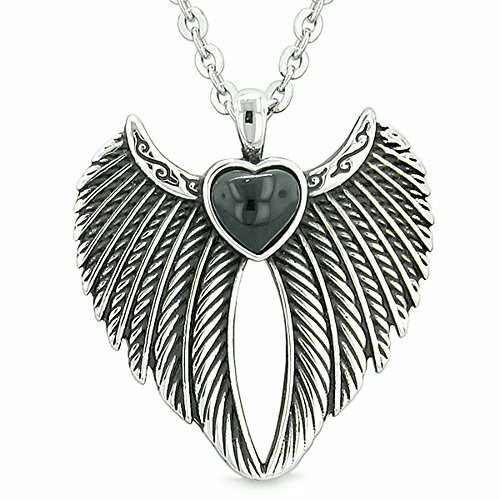 Earrings and necklace cords may have special use labels which must be returned, un-tampered for full refunds. STEAMPUNKERS USA Service Center: Need to replace / repair a cord or bail? Questions about your stone? Attach a photo for more precise assistance. Contact Us from this product detail page. Click ?Ships and Sold by SteamPunkers USA", then ?Ask a Question" on the top right. We will get back to you as soon as we can. 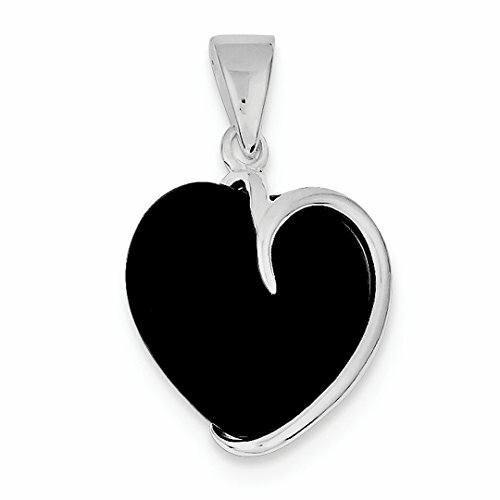 925 Sterling Silver Polished Antiqued Black Onyx Heart Charm Pendant. 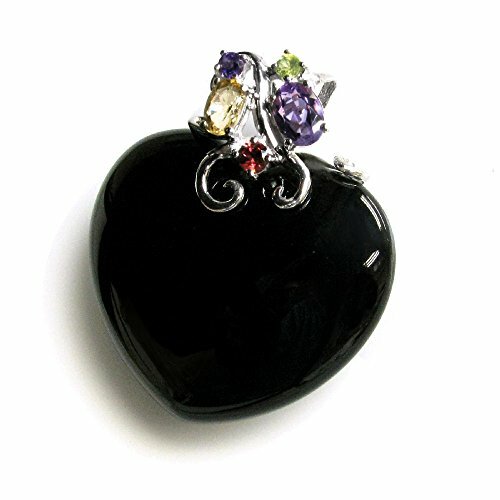 Features: Polished -- Sterling silver -- Onyx -- Antiqued.All Colored Stones Have Been Treated to Produce and Enhance Color: Amethyst - Heat Treated || Aquamarine - Heat Treated || Citrine - Heat Treated || Emerald - Resin/Oiling || Garnet & Rhodalite Garnet - Not Enhanced || Onyx - Dyed || Opal - Impregnation/Dyed/Heat || Peridot - Not Enhanced || Pearls - Bleached/Dyed/Irradiation || Pink Tourmaline - Heat Treated/Irradiated || Quartz - Heat Treated/Irradiated || Ruby - Heat Treated || Sapphire - Heat Treated || Tanzanite - Heat Treated || Topaz - Irradiated/Heat-Treated || Zircon - Heat-treated || Blue, Red & Green Diamond - Irradiated || Black, Brown & Yellow Diamond - Heat Treated/Irradiated. Disclaimer: Diamonds Not verified to have 17 facets. 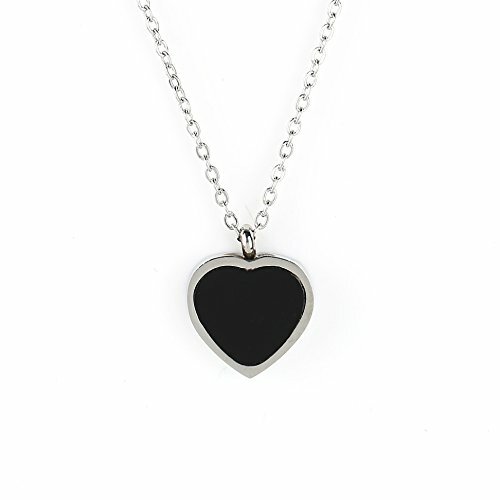 ICECARATS DESIGNER JEWELRY 925 STERLING SILVER BLACK ONYX HEART PENDANT CHARM NECKLACEMaterial Purity : 925Stone Type 1 : OnyxLength : 26 mmMaterial : Sterling SilverWidth : 17 mmProduct Type : JewelryJewelry Type : Pendants & CharmsSold By Unit : EachPendant/Charm Type : ThemedMaterial Color : WhiteOUR MISSION & BELIEFSOur mission at IceCarats is to celebrate our customers and enhance their lives journey, honoring life's memorable occasions and enhancing the beauty of everyday through our extensive collection of quality jewelry.THE ICECARATS STORY - CRAFTSMANSHIP...QUALITY...VALUEJewelry is our passion - IceCarats is devoted to craftsmanship, quality, and value. Each piece hand stamped for authenticityMADE WITH LOVE FROM US TO YOU - QUALITY WITHOUT COMPROMISEWhen you purchase jewelry from the IceCarats collection, you buy with confidence - Lifetime Warranty and 30-Day Returns .ELEGANT GIFT PACKAGING - JUST ANOTHER REASON TO SAY YES!Receive Elegant Gift Packing On Every Order with IceCarats! 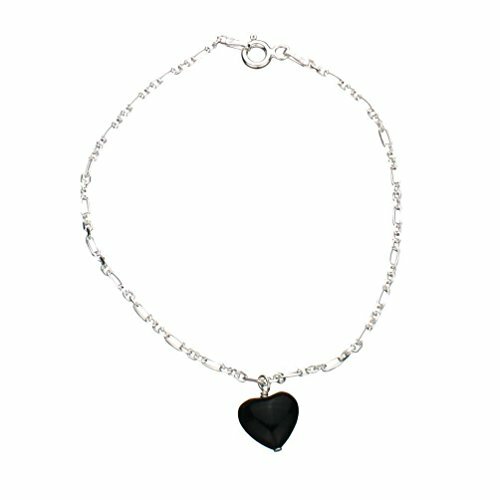 Sterling Silver Charm Bracelet Black Onyx Stone Heart, 7.5"
925 sterling silver bracelet, made in Italy, and black onyx (dyed) stone heart, approx 3/8 inch x 3/8 inches, charm. 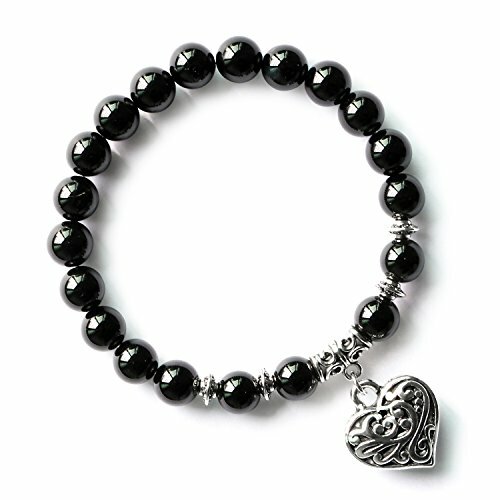 Single strand, length is from loop end to clasp. Chain is nickel free. Organza gift bag include, color may vary. 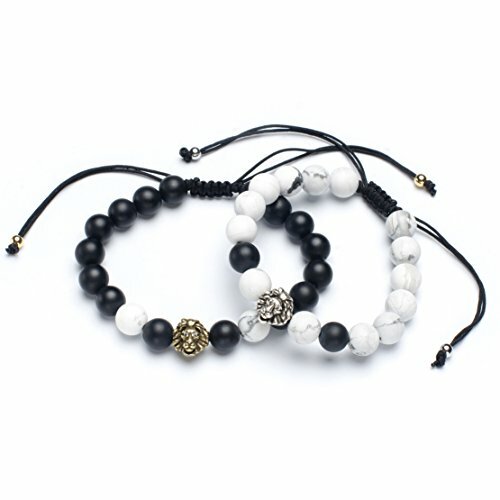 The natural properties and composition of mined stones define the unique beauty of each piece. Stones may have been treated to improve stability, durability or appearance. 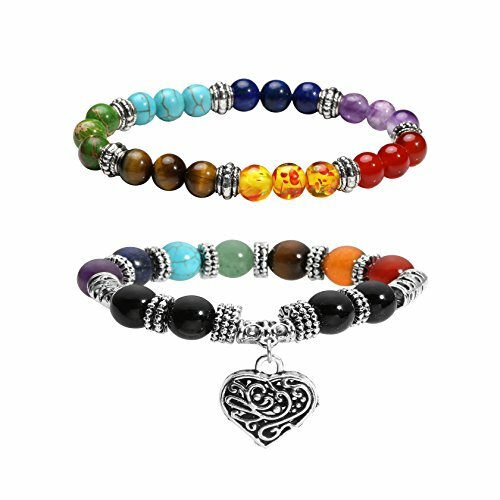 7chakra brings you healing and balancing energy in health, after you wear it, you would fell the improvement in physical and mind, enjoy the calm and peace in your life. Don't hesitate to get one ! Crown Chakra : Amethyst symbolizes peace and security, it is said to bring you inspiration and wisdom. Third Eye Chakra : Lapis Lazuli helps hypnosis and deep meditation, enhances observational insight and spirituality. 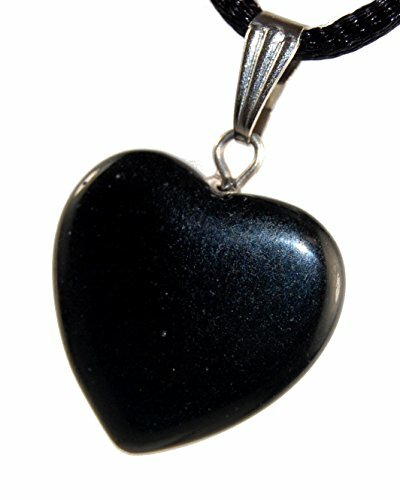 Throat Chakra : Turquoise symbolizes power and status Heart Chakra : Green King Stone helps to resist negative energy. Solar Plexus Chakra : Tiger Eye brings you good luck and healing energy. Sacral Chakra : Amber implied meaning courage and happy, provide balance. Root Chakra : Red Agate symbolizes love and hope, can help people to eliminate stress, alleviate fatigue. Absorption of negative energy, etc. 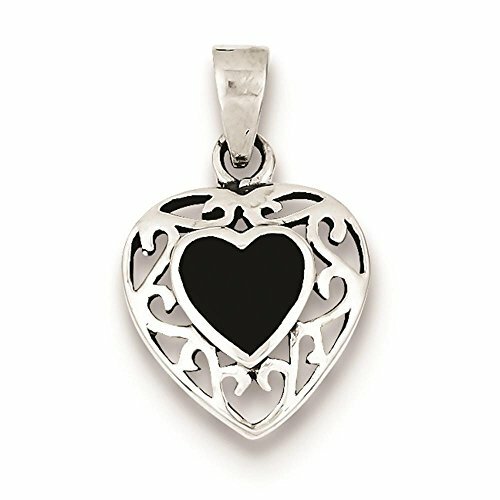 Copyright © Wholesalion.com 2019 - The Best Prices On Onyx Heart Charm Online.